Greetings to all from the USC Wrigley Institute! 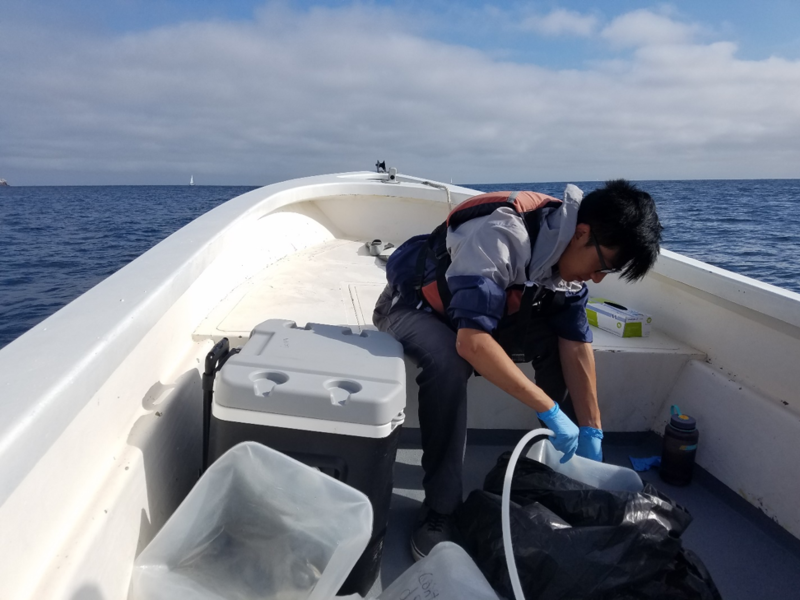 I would like to start by giving a warm thanks to the National Science Foundation, who provided the opportunity and funding for my time as a REU student here on Catalina Island. My name is Candice and I’m a senior biology major and McNair Scholar from Loyola Marymount University. 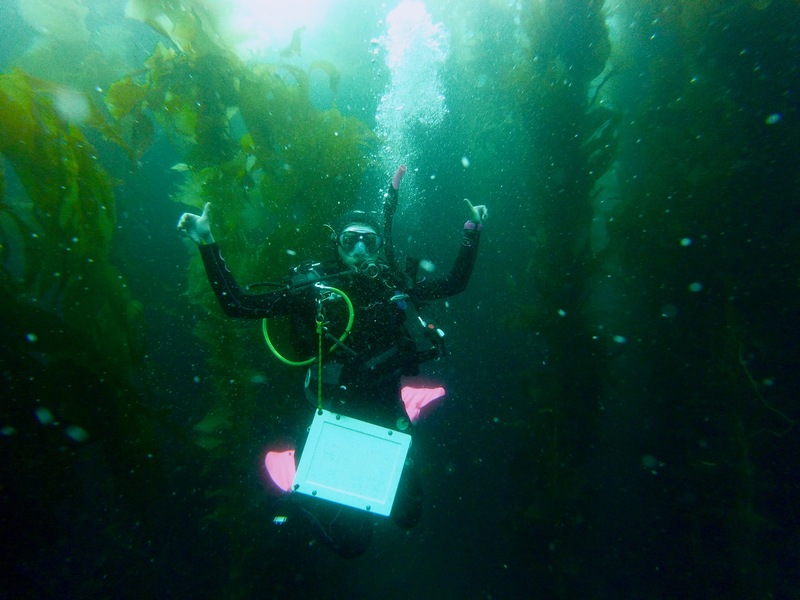 I currently work under Dr. Mark Steele and graduate mentor, Kathryn Scafidi, from California State University Northridge on a project observing fish foraging behavior and epifauna communities within invasive algae beds. As a scientific diver, most of my work involves recording the abundance of different algal species on the rocky reefs and following fish to take note of which algae they are eating. I’ve clocked in some of my longest dives at an hour and a half! This research has really allowed me to explore a whole new world below sea level here on Catalina and I’ve been fortunate enough to see many exciting animals—including soup fin sharks, octopus, and giant sea bass! The biodiversity on the island’s reefs and within the marine protected areas is truly incredible. 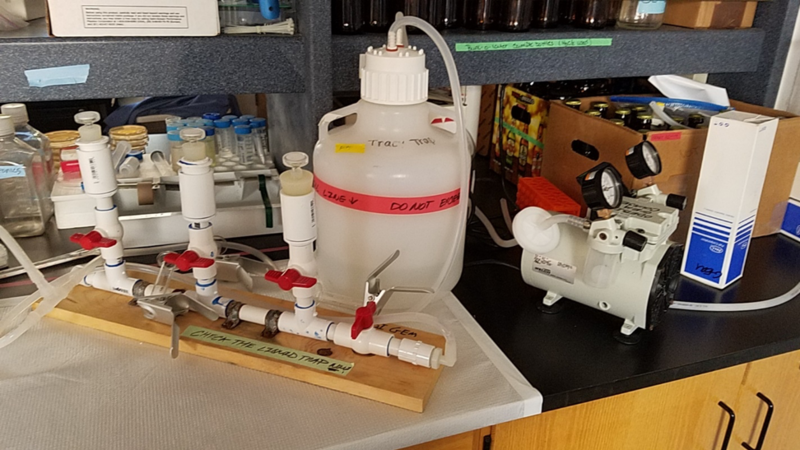 This week, we’re deploying the first round of my personal project looking at whether epifauna prefer to settle on invasive Sargassum horneri vs. native Sargassum palmeri. Kathryn and I spent some time sewing together small mesh cages to house the Sargassum spp. in and we’ll be leaving them on the reef for a few days before collecting them and identifying which small organisms have settled onto each species. It’s been a new and exciting challenge to call the shots on my own portion of the project, but I really value the experience as it prepares me for graduate school. Outside of my research, I spend my free time with my fellow REUs—all of which are some of the most enthusiastic and passionate young scientists I’ve ever met! They have all truly rounded out my summer experience with impromptu movie nights, dock swims, and post dinner volleyball sessions—not to mention the fact that we religiously blast The Beach Boys’ “Kokomo” every single day. It’s nice to know that my new, close friends will become the professional connections of my future career. They’ve been immensely supportive of my summer project and my simultaneous effort in working on applications for Ph.D. programs—I don’t know what I’d do without them! All in all, I can confidently say that island life is one I could definitely get used to, especially here at the Wrigley station. Everyone has been so incredibly friendly; the marine station community really does feel like a family. Seeing everyone work together to promote sustainable energy and conservation has been so refreshing and I know the people here will move mountains in the field. Change here at Wrigley will definitely spark a change in the rest of the world. I recommend that anyone on the mainland visit the USC Wrigley campus, as it’s a beautiful place filled with beautiful people! Hope you all enjoyed the read.